Plant breeding is the key to providing us with varied and better quality foods. Although conventional plant breeding has existed for hundreds of years, it was often time-consuming and labour-intensive. But, breeding methods have come a long way – it's becoming faster and more effective. MAS, or marker-assisted selection, is a biotechnology that uses a traditional breeding approach. It's about finding genetic markers that are linked to the qualities you want; like disease resistance or climate adaptation which then enables plant breeders to breed plants with these desired traits. Through this approach, MAS is an excellent tool for accelerating conventional breeding efforts by increasing speed and accuracy. Smart Breeding: The Next Generation (authored by Benno Vogel, an independent scientist) is a new report that reviews the growing list of traits produced by MAS in an increasingly diverse array of crops across continents. EXCERPT: The scientists who conducted the new study used field-realistic levels of glyphosate, similar to what honeybees may encounter on a farm growing GMOs. They found that learning behavior and short-term memory retention decreased significantly compared with the control groups. J Exp Biol. 2014 Oct 1;217(Pt 19):3457-64. doi: 10.1242/jeb.109520. Epub 2014 Jul 25. Glyphosate (GLY) is a broad-spectrum herbicide used for weed control. The sub-lethal impact of GLY on non-target organisms such as insect pollinators has not yet been evaluated. Apis mellifera is the main pollinator in agricultural environments and is a well-known model for behavioural research. Honeybees are also accurate biosensors of environmental pollutants and their appetitive behavioural response is a suitable tool with which to test sub-lethal effects of agrochemicals. We studied the effects of field-realistic doses of GLY on honeybees exposed chronically or acutely to the herbicide. We focused on sucrose sensitivity, elemental and non-elemental associative olfactory conditioning of the proboscis extension response (PER), and foraging-related behaviour. We found a reduced sensitivity to sucrose and learning performance for the groups chronically exposed to GLY concentrations within the range of recommended doses. When olfactory PER conditioning was performed with sucrose reward with the same GLY concentrations (acute exposure), elemental learning and short-term memory retention decreased significantly compared with controls. Non-elemental associative learning was also impaired by an acute exposure to GLY traces. Altogether, these results imply that GLY at concentrations found in agro-ecosystems as a result of standard spraying can reduce sensitivity to nectar reward and impair associative learning in honeybees. However, no effect on foraging-related behaviour was found. Therefore, we speculate that successful forager bees could become a source of constant inflow of nectar with GLY traces that could then be distributed among nestmates, stored in the hive and have long-term negative consequences on colony performance. A news report cites an alarming 90% drop in the Monarch butterfly population in North America, attributed to the decline in milkweed, which is the only food the caterpillars eat. The Monarch (Danaus plexippus) is one of the world’s greatest insect migrators; it flies some 4,800 km from Canada to Mexico over four generations. The huge reduction in milkweed is attributed by scientists to the widespread cultivation of Roundup Ready GM crops in the U.S., which uses massive amounts of the herbicide, glyphosate. Monarch numbers have dropped from one billion in the mid-90s to only 35 million in 2013-2014. Organizations including the Center for Biological Diversity, the Center for Food Safety, and the Xerces Society have filed a petition with the U.S. Fish and Wildlife Service to list the Monarch as a threatened species under the Endangered Species Act (ESA). Monarch butterflies were once a common sight throughout the North American heartland. In Mexico, where they overwinter, single trees would often be covered in thousands. But declines in milkweed – their caterpillars’ only source of food – have led to a 90 percent decline in monarch numbers. Now, the U.S. Fish and Wildlife Service (USFWS) is reviewing a petition that would grant the iconic species protection through the Endangered Species Act (ESA). La Soberanía Alimentaría ha sido implementada constitucionalmente en el Ecuador, sin embargo muchas de las acciones y políticas apuntan a beneficiar al modelo dominante de producción de alimentos, basado en la agroindustria, monocultivos intensivos, agroquímicos y transgénicos. En este artículo se reflexiona sobre el papel de la agricultura familiar campesina como generador de Soberanía Alimentaria, y por otro lado la amenaza a los mismos por parte de la agricultura agroindustrial basada en transgénicos. Se analiza también el papel que ha tenido la ayuda alimentaria en la introducción de transgénicos en Latinoamérica y otras regiones del mundo. First introduced in the 1990s, 84.6% of all genetically modified (GM) crops worldwide carried herbicide resistance traits (144 mil. ha) by 2012. Herbicide-resistant (HR) crops occupy about 59% of the 170.3 million hectares under GM cultivation globally, with GM crops with stacked traits (basically herbicide and insect resistance) covering 25.6%. Many studies have been done on HR crop use patterns and impacts. A review of these studies has been jointly conducted by three government agencies from Germany, Switzerland and Austria, to extract the lessons learnt, paying particular attention to the impact on biodiversity. Scientific studies have established that agricultural intensification and pesticide use are among the main drivers of biodiversity loss. There are concerns that HR crops will help to further intensify farming and may therefore increase pressure on biodiversity. The review finds evidence to conclude that HR crops cannot reduce herbicide use in the longer term, and will in fact be associated with a further loss of biodiversity including whole food webs, wild flora, seeds, and ecosystem functions in agricultural fields. Other concerns raised include observations that in regions where HR crops are widely adopted, less crop rotation and crop diversification takes place, with a clear trend towards monoculture; the development of herbicide resistant weeds, resulting in farmers resorting to higher herbicide doses and the use of other herbicides; and the spatial and temporal spread of the HR trait, which is a particular concern in centres of crop origin and regions where interfertile and weedy hybrids occur. In addition, there has been little, if any, contribution of HR crops to increase crop yields. According to the review, “…herbicide resistant crops are not part of the solution, but part of the problem”. It makes a call to stop the loss of biodiversity, reverse the current development trend in agriculture, and increase biodiversity in agricultural ecosystems with more environmentally friendly practices and less dependence on pesticides. The Executive Summary of the paper and the link to the full paper are given below. - A joint paper of the Federal Agency for Nature Conservation (BfN) Germany, Federal Office for the Environment (FOEN) Switzerland and Environment Agency Austria. Edited by Tappeser, B., Reichenbecher, W., & Teichmann, H. BfN (2014). Conservation of biodiversity is high on the agenda of international and national environmental policies though not very present in public awareness. The need to protect biodiversity and stop the loss was acknowledged in the Convention on Biological Diversity (CBD), internationally agreed on in 1992, and underscored by relevant decisions since then. It has been known for some time that intensive high input farming is one of the main drivers of ongoing biodiversity losses in agricultural landscapes. An indicator for such losses is the diversity and abundance of weed flora. Transgenic crops resistant to the herbicides glyphosate (accounting for the great majority) and glufosinate have first been cultivated commercially in the nineties of the last century. Since then, a wealth of information has been collected on use patterns and on impacts of herbicide-resistant (HR) crops. There are concerns that HR crops will help to further intensify farming and may therefore increase pressure on biodiversity. The need to study potential environmental consequences of changes in herbicide usage due to transgenic HR plants has recently been underlined by the Council (of Environment Ministers) of the European Union (EU). This paper summarizes the lessons that can be learned from the experience up to now. This article is a response to "Climate sceptics exploit double standards of eco-warriors", by Fred Pearce, which claims that Greenpeace cherry-picks data in its campaign against genetically modified crops. Monsanto’s genetically modified (GM) soybean ‘Intacta’ (MON 87701×MON 89788) has both an insect resistance trait and a herbicide (glyphosate) resistance trait. Insect resistance comes from the expression of Cry proteins from Bacillus thuringiensis (Bt). Although the Bt soybean has been found to be effective against Lepidopteran pests, it is not effective against the southern armyworm, Spodoptera eridania, a non-target organism which feeds on soybean leaves and pods. Such organisms are becoming economically significant soybean pests. A recently published scientific study in Brazil, co-authored by Monsanto employees, has evaluated the impact of Intacta on Spodoptera eridania and on the development of Telenomus remus, which parasitizes the former’s eggs (Item 1). The study found that the Bt soybean reduced S. eridania’s larval development duration by two days and lengthened the adult male lifespan by three days. The researchers describe this as “favorable to pest development”. This was attributed to be a likely result of unintended changes in plant characteristics caused by the insertion of the transgene. Thus, the results represent a warning that farms planting the Intacta soybean may see an increase in S. eridania populations. However, the Bt soybean had no effect on T. remus, which can help prevent S. eridania outbreaks. Genetically modified crops with insect resistance genes from Bacillus thuringiensis Berliner (Bt-plants) are increasingly being cultivated worldwide. Therefore, it is critical to improve our knowledge of their direct or indirect impact not only on target pests but also on non-target arthropods. Hence, this study evaluates comparative leaf consumption and performance of Spodoptera eridania (Cramer), a species that is tolerant of the Cry1Ac protein, fed with Bt soybean, MON 87701×MON 89788 or its non-Bt isoline. We also assessed the comparative performance of the egg parasitoid Telenomus remus Nixon on eggs of S. eridania produced from individuals that fed on these two soybean isolines as larvae. Results showed that Bt soybean reduced by 2 days larval development and increased by 3 days adult male longevity. Therefore, we conclude that the effect of Bt soybean MON 87701×MON 89788 on S. eridania development and reproduction is small, and favorable to pest development. These differences are less likely to directly result from the toxin presence but indirectly from unintended changes in plant characteristics caused by the insertion of the transgene. Our results should be viewed as an alert that S. eridania populations may increase in Bt soybeans, but on the other hand, no adverse effects of this technology were observed for the egg parasitoid T. remus which can help to prevent S. eridaniaoutbreaks on these crops. A new scientific publication co-authored by Monsanto employees, is warning that the cultivation of the genetically modified soybean Intacta (MON 87701 × MON 89788) could promote the spread of specific pest insects. According to the authors, the effects are likely to be caused by unintended effects in the plants, possibly arising from the insertion of the additional DNA. The genetically engineered soybean produced by Monsanto is resistant to herbicides containing glyphosate and produces a Bt insecticide. Brazilian scientists in collaboration with Monsanto employees have discovered that certain pest insects (Spodoptera eridania, southern armyworm), which can cause considerable damage in soybean fields, develop faster and live longer if their larvae feed off the plants. London, 13 Oct (Mae-Wan Ho*) -- US corn prices plummeted as China rejected all shipments containing traces of Syngenta's MIR162. Farmers from 5 major corn growing states have filed 3 class action lawsuits against Syngenta, claiming damages of more than $1 billion**. Syngenta released MIR162, trade name Agrisure Vipera, in 2009. It is engineered to make a Bacillus thuringiensis (Bt) protein vip3Aa20 toxic to lepidopteran insect pests (butterflies and moths) [Event Name: MIR162, International Service for the Acquisition of Agri-Biotech Applications, accessed 13 October 2014, http://www.isaaa.org/gmapprovaldatabase/event/default.asp? EventID=130], and also has a gene pmi (phosphomannose isomerase) from E. coli to allow positive selection for the transgene. It was created with Agrobacterium tumefaciens-mediated plant transformation, a particularly hazardous vector system that risks further horizontal gene transfer (see ‘Ban GMOs Now', ISIS Special Report available at http://www.i-sis.org.uk/Ban_GMOs_Now.php). While MIR162 is approved for use in the US, China has not allowed its import into the country. Syngenta is blamed for destroying the export of US corn to China, which led to depressed prices for domestic corn, according to Volnek Farms, the lead plaintiff in the lawsuit filed in Omaha, Nebraska federal court. The two other suits were filed in Iowa and Illinois federal courts. None of the farmers involved in the lawsuits planted MIR162 seed in their fields in Illinois, Iowa, Kansas, Missouri, and Nebraska. But their harvested crop was contaminated with traces of the transgenic trait, and hence unsalable to the Chinese market. Although Viptera has been planted on only about 3% of US farm acreage, it is difficult to say for sure "that any shipments of US corn will not be contaminated with trace amounts of MIR162", the Nebraska plaintiff stated. The National Grain and Feed Association (NGFA) had encouraged Syngenta to stop selling Viptera, according to the Iowa claim. The NGFA estimated that actions taken in China against US corn have caused prices to drop by 11 cents per bushel. The Iowa suit also claims that the release of Syngenta's Viptera caused the US-to-China export market to drop by 85%. Nebraska plaintiffs, too, accuse Syngenta of having crippled the 2013-14 corn export market to China. The NGFA reported in April 2014 that China had barred nearly 1.45 million tons of corn shipments since 2013. In 2011, Syngenta requested in federal court that a grain elevator firm, Bunge North America, to remove its signs that said it would not accept Vipera corn. The request was denied. Concern over the safety of GM food may have played a role in a recent decision by China's officials to move away from GM production. In August, China's Ministry of Agriculture announced it would not continue with GM rice and corn ["End of the line: GMO production in China halted", RT Question More, 21 August, 2014, http://rt.com/news/181860-gm-china-rice-stopped/]. 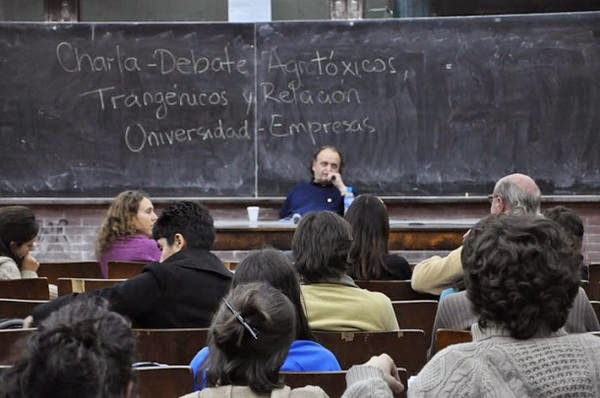 El profesor Andrés Carrasco tuvo enemigos muy poderosos, pero también muchos amigos en un país que depende en gran medida de la soja transgénica. A continuación mostramos el homenaje que le han rendido en un medio de comunicación de Venezuela. después de su muerte el pasado mes de mayo. La prensa corporativa argentina ha mantenido silencio sobre su muerte y su trayectoria, por las razones que se explican en el artículo. It has generally been assumed that, because rice is largely a self-pollinated crop and dispersal of its pollen by wind is limited, there is low risk of gene ﬂow between cultivated GM rice plants and other cultivated or wild rice. Few studies have, however, paid attention to the impact of insect pollination on gene flow in rice. A large-scale study conducted in China has found that over 510 insect species visited rice ﬂowers and several of these carried away large amounts of pollen, some up to 500 metres away. In a field-cage experiment with GM and non-GM rice, using honeybees as pollinators, the screening of over 1-5 million germinated offspring seeds over three years revealed that honeybees increased transgene ﬂow in rice signiﬁcantly. The researchers concluded that “the potential exists for long-distance gene escape due to the abundance of insects that carry rice pollen”. They stressed that this factor must form part of the ecological risk assessment for GM rice as well as for other GM crops. The summary of the research report published in the Journal of Applied Ecology is reproduced below. 1. 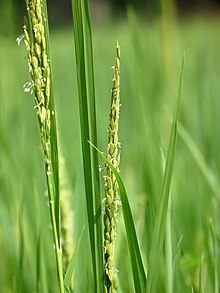 Rice is one of the most important crops in the world. Several transgenic varieties of rice have been developed, and some have recently entered pre-production trials. One concern with genetically modiﬁed (GM) crops is transgene escape, but prior studies suggest this risk is low for rice because it is self-pollinated and the dispersal of pollen by wind is limited. 2. Little is known about the impact of pollen transport by insects. We characterized the insects visiting rice plants during anthesis and considered the effects of insect pollination on gene ﬂow. 3. We conducted a 2-year nationwide survey in China and identiﬁed more than 510 insect species that visited rice ﬂowers. Honeybees, hoverﬂies and several other species carried large amounts of pollen. The European honeybee Apis mellifera visited rice ﬂowers regularly with daily foraging activity peaking between 12.00 and 13.00 h.
4. We monitored 20 European honeybee colonies located 100–1000 metres away from rice ﬁelds in mixed agricultural landscapes and found the honeybees carried viable pollen at least 500 m away from the rice pollen source. 5. We used four GM rice lines as pollen donors, their non-GM parental varieties as pollen recipients and the European honeybee as the pollinator in ﬁeld-cage experiments to assess whether honeybees increase the frequency of gene ﬂow in rice. Results from screening over 1-5 million germinated offspring seeds over a 3-year study period showed that honeybees signiﬁcantly increase transgene ﬂow in rice. 6. Synthesis and applications. Our results indicate that a remarkably high diversity of insects visit rice ﬂowers in China and that hundreds of species including honeybees carry large amounts of rice pollen. European honeybees carry viable pollen over long distances, forage on rice ﬂowers regularly and increase the frequency of transgene ﬂow. Insects mediate gene ﬂow in rice more than previously assumed, and this should be taken into consideration during the ecological risk assessment of transgene ﬂow in self-pollinated and/or anemophilous crops. El sometimiento científico se agrava cuando el fundamento científico que impulsan las empresas fabricantes y comercializadoras de organismos genéticamente modificados (OGM) es una ciencia anacrónica y con un valor de verdad cada vez más cuestionable y cuestionado entre y desde amplios sectores de la propia comunidad científica. Esta mirada anacrónica, todavía hegemónica, ha encontrado en el reduccionismo biológico y el absolutismo genocéntrico de los científicos, su principal sostén. La complejidad es ignorada en la explicación biológica actual, refleja la tendencia a la clasificación, al aislamiento, y a la manipulación de los genes concebidos como unidades ontológicas. Esto no solo es una teoría biológica general errónea, sino que afecta a la comprensión de la naturaleza y se convierten en un instrumento. Un instrumento alineado con la necesidad, cada vez más imperiosa, de controlar y manipular la naturaleza habilitando específicas aplicaciones en la tecnología que salen de los procesos fisiológicos ontogénicos y filogénicos. En efecto, la falla de la teoría general no es una equivocación, sino que se produce en una relación compleja con los intereses industriales concentrados y hegemónicos que han encontrado en esa falla una oportunidad de negocios para fortalecer el error por necesidad y sometiendo a la propia ciencia. Traditional breeding has left GM in the dust when it comes to salt-tolerant crops. Things aren’t looking so good for Monsanto these days. A fourth-quarter loss of $156 million. A $90 million payout to a West Virginia town poisoned by a Monsanto factory. New reports coming out every day citing the health hazards of Monsanto’s Roundup, and blowing holes in the company’s lies about how it “helps” farmers, “protects” the environment and will feed the world. But with your help, things will look much worse for the Biotech Bully on the morning of November 5—assuming we get enough Oregon voters to vote YES on 92, and maybe even get enough Colorado voters to vote YES on Prop 105. Oregon’s Measure 92 and Colorado’s Prop 105 are citizen-led ballot initiatives that if passed, will require mandatory labeling of genetically modified organisms (GMOs) in both of those states. As of today, the YES on 92 campaign is leading in the polls, 49 percent to 44 percent. But here’s the catch: 7 percent of Oregon voters are still undecided. If we want to win in Oregon, we need to get the majority of those undecided voters on our side. That’s why OCA, through our 501(c) 4 lobbying arm, Organic Consumers Fund, has just pledged an additional $150,000 (upping our total contribution to $650,000) to the YES on 92 campaign, to fund more ads and reach more voters. And why we hope you’ll help us meet that pledge by making a donation today. We lost heartbreakingly close GMO labeling ballot initiatives in California (2012) and Washington State (2013). Those losses strengthened our resolve to keep the GMO labeling battle alive. Now it’s time to win. A win in Oregon will deliver a fatal blow to the campaign by the Gene and Junk Food giants to keep you in the dark about what’s in your food. A win on Colorado will be icing on the cake. Monsanto has been forced to spend millions of dollars fighting our GMO labeling campaigns—on top of the millions it’s had to spend on public relations campaigns and lawsuit settlements. Let’s not cry for Monsanto. Let’s just beat them.